List of people who intend to run, vehicle, member/non member. Priority will be given to paid members running Polo's, then non-paid members running polos, followed by paid members not running polos, and finally non members non polos... if that makes sense! Lame! Anyone gonna bring a Polo..? Put me down for this, dunno what I'll be running though. Bring the 9n3, you can be my reference point to see how many BHP I'm missing. What's the price for non members? 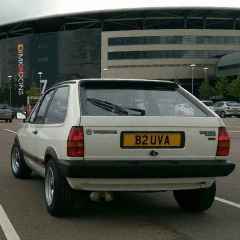 Might run the rocco, if its not burning all the oil known to man or broken at the time, also if I've got the cash! If you get your name down then we can get the order sorted out ! I really want to do this but never done a rolling road before. I want to see how close the manufacturers figures are to reality. Any advice about when you have done one, so I can take the plunge? What are you concerns or what'd you like to know? You pay them money, then they'll put your car on the rolling road. For a FWD car they'll drive forwards into it, then drop the bridge between the two rollers so the cars tyres are just sat on the rollers, slowly drive the car which then centralises it on them, they'll then chock the rear wheels in place, and strap the car down. When it's all setup and ready they'll drive up through the gears to the test gear, then ease off til the cars st around 1500-2000rpm, then start logging, and go wide open throttle until the car pulls up to the rev limiter or the power curve flattens/starts to drop off. They'll then let off the throttle and let the car run back down to 0 wheel speed - this calculates the losses in the drivetrain. From this they can then calculate your power "at the fly wheel" like actual engine power as opposed to the power produced at the wheels which is where they measure it. Once they have all that - they'll take your car off and give you a print out graph of your results. I can feel a bit horrible to watch as your car is in front of you screaming up the to the Rev limiter, but it's not really any worse than what you do on the road anywho! Just to note I wont be there until 9:30-10ish as I&#39;m setting off at 6am that morning!